In this sixth-grade humanities lesson, students trade between three tables that represent China, India, and Rome to obtain all the ingredients needed to prepare Rice Pudding. 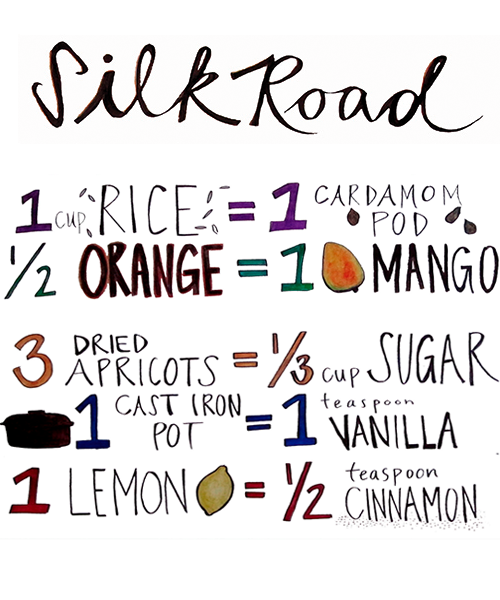 This is the fourth and final Silk Road lesson. Cite the contributions of China, India, and Rome to the Silk Road. Describe the significance of trade along the Silk Road on how we eat today. Explain the magnitude of cultural exchange that occurred as a result of trade along the Silk Road. Name ideas, goods, and foods from China, India, and Rome that were traded along the Silk Road. Trade goods and foods they have for goods and foods they need to prepare rice pudding. Trade goods and foods silently, using visual cues and other forms of silent communication to make the necessary trades. Copy the Rice Pudding recipe to hand out. Copy the Trading Values sheet, one for each table. Copy the China worksheet, once for the corresponding table. Copy the India worksheet, once for the corresponding table. Copy the Rome worksheet, once for the corresponding table. Conceal ingredients and tools and with a tablecloth. Meet the students outside and instruct them to wash their hands and go directly to their tables when they enter the kitchen. Welcome students to the kitchen for the culminating lesson of their Silk Road journey. Inform the students that today each table will represent China, India, or Rome. Explain that on each table, under the tablecloth, is a set of goods and foods that is unique to each region. Explain that today’s recipe uses ingredients from all three regions of study along the Silk Road: China, India, and Rome. The recipe is a secret that will be revealed at the end of the trading. Invite students at each table to state their region, and make educated guesses about items that might be under the tablecloth using the visual aid provided. Explain that each table has a worksheet that provides a list of the goods and foods needed to prepare the secret recipe, and also a Trading Values sheet, which replicates information found on the visual aid. Explain that students will work in pairs, and are responsible for trading their region’s items in two places: once in each of the other regions. Tell students that once all groups have all the necessary ingredients, there will be a final trade: information for information. Students will explain the item they were trading and what their item was worth in the other regions. In return, the teachers will give them the secret recipe. Tell students that as a final challenge, the trading period will be silent. That means no one may speak, not even to individuals within their own group. This is because on the Silk Road, many traders did not share a common language, making other forms of communication crucial. Assign a scribe to use their region’s worksheet to keep track of the trades as they are completed. Unveil the ingredients and assign each pair of students an item to trade. Have students use the worksheet to determine what goods and foods from their region they need for the recipe, so they know what remains for trade. Have students visit the other regions (tables) to make their trades. As students are trading, have the scribe keep track of the goods and foods that are coming to the table. Once all the trading is complete, have each pair of students relay what good or food they traded and what it was worth in the other two regions. Tell students that the secret recipe they will be preparing is rice pudding, and give them the recipe so they can begin to cook. Go over the recipe steps and assign jobs. Ask students to use their fingers to rate the food on a scale of 1 to 5. If there is time, ask students to share whether, based purely on the foods native to each region, they would have preferred to live in China, India, or Rome during the time of the Silk Road. Small-group Chef Meetings: We do the chef meeting at our small groups for this lesson instead of gathering around the middle table. This helps to focus students' energy (which tends to be high upon entering and seeing the concealed items on each table) and generally results in students having a better understanding of the trading process, which can feel complicated to some when it is explained to the full class. Synchronizing Timing: Doing small-group chef meetings instead of one large meeting together can make it difficult to coordinate timing across groups. It is important that the trading begins all at the same time, so the three table teachers signal to one another that their groups are ready to trade by standing up. When all three teachers are standing, one signals the beginning of the silent trading period by hitting a gong—the clue to students that it is time for silence. Silent Trading Period: We have our students trade in silence because it helps to keep the energy more focused during this very exciting activity. It also is a fun challenge for students to find new forms of communication to make the necessary trades. Dietary restrictions: Keep alternatives on hand for vegan or lactose-intolerant students. Coconut milk and oil work as excellent substitutes for dairy milk and butter in this recipe. Rice: We use 5 cups of jasmine rice to make three batches of rice pudding in classes of about 30 students. We always set the rice cooker on well ahead of time so that the rice is ready before the trading period. Cardamom: Smashing the cardamom pod to slightly open it helps to release its flavor. Raisins: The recipe calls for adding the recipes into the pudding, but we always facilitate a group decision about whether to add the raisins or keep them as an optional topping because some students have a strong dislike of raisins. Citrus: We teach students how to supreme the orange (and lemons) by cutting off the skin and then cutting out segments, resulting in citrus slices without pith. Mango: The mango is often a very popular topping. Cut it up small so that everyone can have some. Fair share: When we sit down to eat, we always explicitly name that because we are sharing toppings as a group and everyone will be serving their own, it is important to take only enough of each so that everyone who wants some can have some. When is it done? Students often wonder if you can you overcook rice pudding, or how to tell when the pudding is done. We explain that you can't overcook rice pudding because deciding when it is done is based on personal preferences around texture and thickness. The longer it cooks, the thicker it will be. Stirring: Stirring the rice pudding helps it to develop a creamy texture by releasing the starch from the rice, like risotto. Leftover rice: We always point out to our students that this recipe is an excellent use for leftover rice. Many are very excited to hear this because they often have leftover rice at home. Sending spices home: We try to keep a few extra spices on hand for students to take home if they want to make the rice pudding. Discuss the legacies of Roman art and architecture, technology and science, literature, language, and law.